They’re easily recognizable by their whiskers and large tusks, but there’s way more to the sociable walrus than just those distinctive features! The marine mammal can be found in wide areas around the North Pole and is divided into three subspecies, based on the waters where they are found – Pacific, Atlantic and Laptev (referring to the Laptev Sea, north of Siberia). There are far more Pacific walruses – approximately 200,000 – than any other kind. Atlantic walruses number only around 20,000 while Laptev walruses range from 5,000 to 10,000. The walrus is known as a “keystone species” in the Arctic, which means it has a large effect on its environment and an equally large role in maintaining the ecological structure of its habitat. The walrus has only two natural predators – the killer whale and the polar bear – but they don’t seem to bother with the walrus too much. The walrus can be a formidable foe, thanks not only to its massive size (a male can weigh up to 1.5 tons) but also to its tusks, which it uses aggressively in defense and during mating season. The tusks, which are overgrown teeth, have other practical uses. Walruses can use them to poke holes in ice for breathing, and also to pull themselves out of the water. Their whiskers are extremely sensitive, allowing them to detect food sources on the ocean floor. It prefers to eat shellfish like mollusks, and other marine organisms. 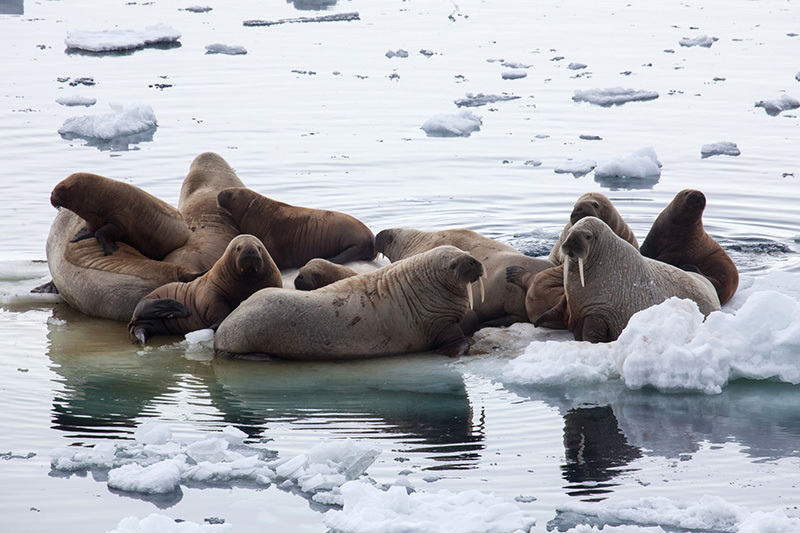 The walrus’ hunting and feeding process also has a benefit to the arctic environment – as it forages, it disturbs the sea floor and releases nutrients into the water. Of course, the walrus’ other main feature is its thick skin, or blubber, which protects it and helps it to survive in the icy arctic waters. The animals used to be far more numerous than they are now; population decline is based mainly on overhunting in the 18th and 19th centuries, and some subspecies are now extinct. Commercial hunting of the walrus is now prohibited in all countries where the animal is found, although some aboriginal hunting is still permitted. 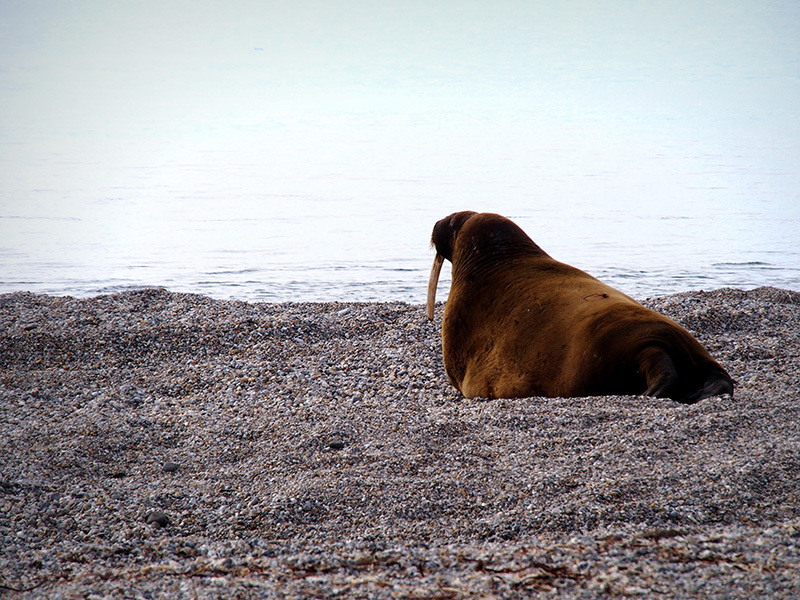 Climate change is another threat to the walrus, which relies on sea ice for feeding and reproductive purposes. 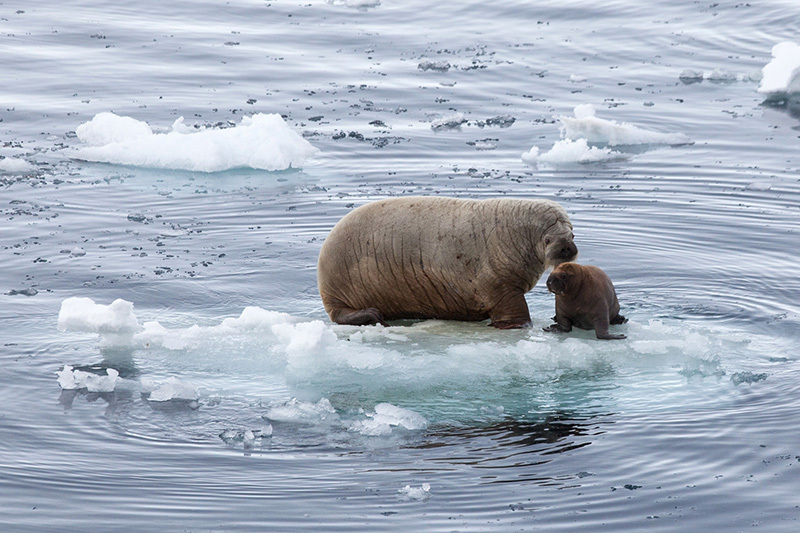 As ice diminishes, mothers and babies can sometimes be more easily separated during the year-long period when calves are weaned; if this happens, a calf may starve. Walruses are social animals who often congregate by the thousands on rocky beaches in the summer and fall months, after their migration. They can live up to 40 years in the wild. You’re likely to see these magnificent animals and others on your Arctic adventure! Get in touch with us today to book your expedition!